Happy New Year! We are open New Year's Day and see many return customers who visit family in the area each year. 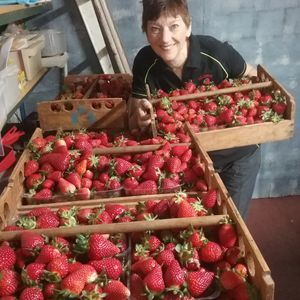 January is one of the busiest and hottest months so we hope each year that our strawberries produce lots of fruit for all the pick your own. The Australia Day long weekend signals the end of the holidays and is a popular time for families to take a break and stay in The Farmhouse. Kids are back at school and the weather is hot! We all have a little breathing space before the Autumn crop begins. 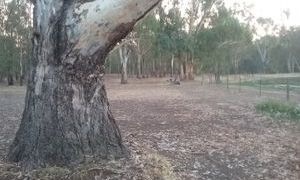 By this time we are usually looking forward to some rain to settle the dust and green up the carpark and the places on the farm that don't get irrigated. The Safari Retreat is very popular for Valentine's Day, seriously romantic! March is lambing time! 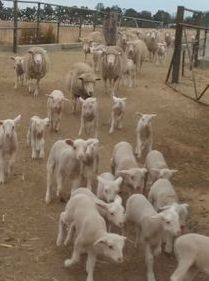 How cute are those little woolly bundles. It's a busy time rounding the sheep up each night into a fox-proof enclosure, letting them out to graze during the day and feeding them extra hay. It is also a popular time for families to stay in The Farmhouse, particularly the Labour Day long weekend. 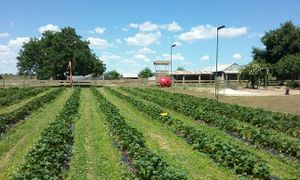 School holidays, Easter, Anzac Day - open every day for lots of strawberry fun, picking and eating strawberry ice cream and strawberry sundaes. We often do school holiday programs for kids and parents to participate in. Check out Facebook for updates. Pete begins to prepare the paddocks for the next lot of strawberries and plants garlic. The strawberry rows are all formed up and it's time for you to adopt your very own plant. $15 per plant gives you all its fruit plus a kg from the pick your own patch. Soon you will plant it then you can visit it, talk to it and watch its growth. $2 from each sale goes to the local kinder or school of your choice. Buy now and get your special number. Go to the Online Shopping page. Bring Mum or Gran for a High Tea for Mother's Day. Dates and booking at the Online Shopping page. The plants are in and they will sit quietly over the winter with all the activity happening under the soil. Queen's Birthday weekend is a great time to have a Glamping weekend away at the Safari Retreat. Sit around the campfire, cook some damper and perhaps a camp oven meal and then cosy up under the doonas and rugs in the King sized bed. Winter is a good time to enrol in a Jam Making Masterclass with Pete. Make traditional strawberry and blackberry jam from Belstack fruit and learn how to make a healthier version with xylitol. $50 per person includes strawberry and blackberry jam to take home plus recipes and tips. Book your place on the Online Shopping page. Why not gather a group of 8 friends and stay over in The Farmhouse for the weekend? There is a log fire and gas heating plus electric blankets on all the beds. Marg will teach some knitting classes during the holidays for anyone 10 and older. Check it out at the Online Shopping page. Hockey comp in Shepp. Our guests in The Farmhouse are very involved in this busy time. 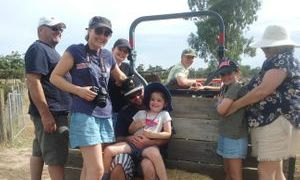 We will be busy building decks for our next accommodation option, Bush Glamping for families. 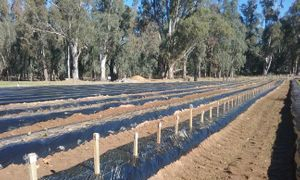 If it's rained we plant more native trees for windbreaks and shade. 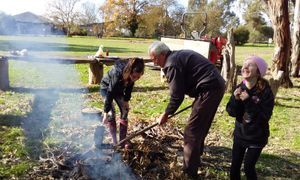 What about booking in a Bushman's Damper Making class? Book at the Online Shopping page. Hooray, it's spring. The adopted strawberry plants are growing leaves very quickly and will start flowering towards the end of the month. No frosts please! Shaun the Shearer comes to give all the sheep (and Manauri the alpaca) a haircut. Brrrr! Hope it's not too cold without your woolly coats, sheep. The Goulburn River could be in flood if we've had rain. It rises into the picnic area below the carpark. It's school holidays again! Everyone is looking forward to the new season's crop of strawberries. Queensland fruit is available all winter but it's not the same as picking your own biodynamic Belstack fruit. Ours keeps fresh longer and tastes sweet and juicy. The fruit can't come quick enough, but no matter what we do it's not until the end of October that pick your own starts. 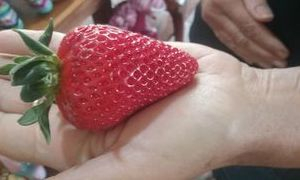 Peak time for strawberries. Large, delicious, oodles of them! Our record size is 95g from back in 1995. 2018 saw lots of 90 grammers, will we beat it this year? Strawberries are a favourite for Melbourne Cup weekend, as is The Farmhouse, Safari Retreat and Bush Glamping. Book early so you don't miss out. The approaching end of the school year sees lots of kids visiting for the Strawberry Education Program. 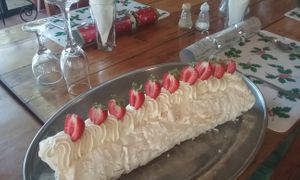 Strawberries are very popular for Christmas feasts so December is a busy month. We also have a short blackberry and boysenberry season before Christmas. Excess goes in the freezer for sale all year for jam and smoothies. Don't forget our Gift Vouchers are ideal Christmas gifts. Buy them at the Online Shopping page. We are open all the Christmas holidays except 25th and 26th December, unless you are staying in The Farmhouse, Safari Retreat or Bush Glamping, then it's open as usual for you!